Ground. Ground. Ground. Aircraft. Ground. Ground. Ground. Figure 2-2. Russian 7.G2-mm Maxim Machine Gun Model 1910 on Sokolov Mount. The gun is a late version. the early days, not only in Russia but in England and Gcrmanv as well. In a military publication dated 1912 there appears a mention of a new version, Model 1910, which differs from its predecessor in the substitution of lighter materials, thereby reducing the weight to 54 pounds with water jacket filled or 44 pounds dry. The favorite Soviet system of mounting for the Model 1910 is ihe Sokolof two-wheeled arrangement, which has also been used with very little deviation for over forty vcars. The outstanding feature which appears in recent modifications of Model 1910 is the tractor-type radiator design used on the water jacket to expedite filling. This design was originated by the Finns and copied by the Russians. The steam and overflow pipe is very similar to the kind used on American heavy farm machinery. During the decade preceding World War I, all the nations of Europe were interested in the advent of the light machine gun. or machine rifle. The influence of the Maxim gun was strong during this period. Most interest was concentrated on gas operated weapons of the fixed barrel type, but in Russia there was little activity in this direction. How-ever, the reliable action of the Maxim gun which had been imported from England had been incorporated into the thinking of military men in Russia. Figure 2-3. The 7.62-mm PV-l. an early Soviet aircraft machine gun, which features the Maxim action. belt. The weight was considerably less than that of the water-cooled model; the finished product weighed only 31.7 pounds. Shortly after the end of the war with Poland., an attempt was made to lighten the Maxim and produce it in an air-cooled version. The design of this particular weapon was under the direction of F. V. Tokarcv, and it was designated M T to indicate, Maxim-Tokarev. Tokarcv was doubtless inspired bv both the Geiman Parabellum and the British Vickcrs. The arrangement of the trigger and the shoulder stock resembles vers strongh that illustrated in I nitcd States Patent No. 9421(>7, which was granted in 1909 to Dawson and Buckham, assignors to Vickcrs. Figure 2 4. 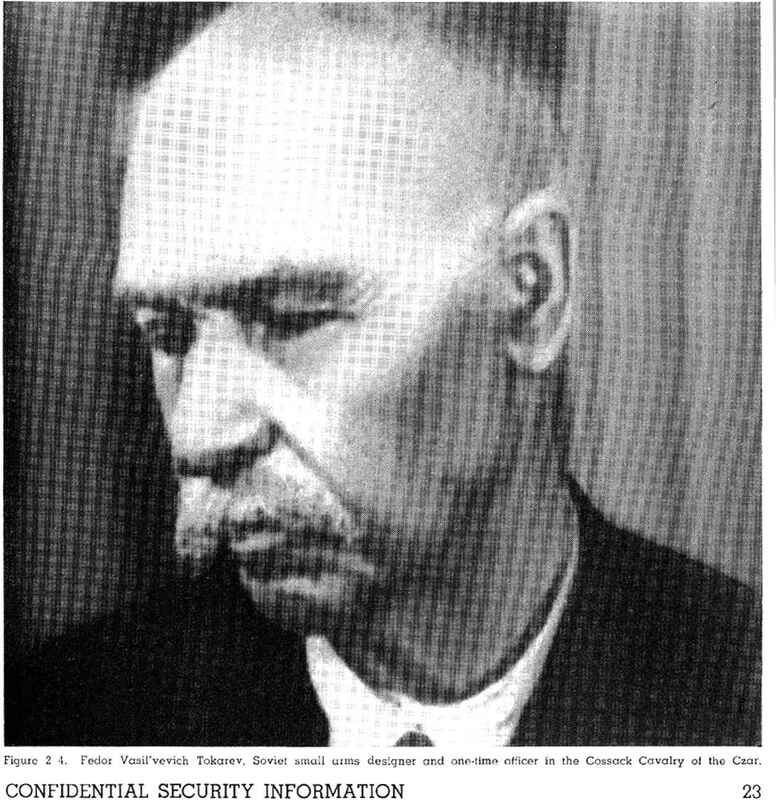 Fedor Vaail'vevich Tokarev, Soviet small aims designer and ono-tima officer in the Cossack Cavalry ol the Czar. Figure 2 5. Maxim-Tokarcv Machinc Gun, 7.62-mm, as used in the Spanish Civil War. 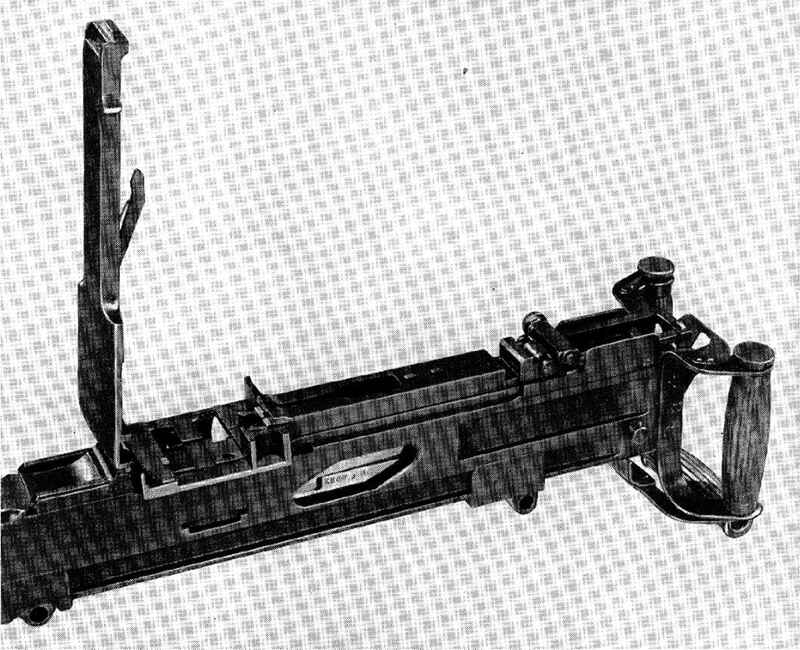 metal legs in front and a wooden stock that fits against the operator's shoulder. This weapon was chambered for the standard 7.62-mm infantry' rifle cartridge. In 1928, a test of the M T was announced in the Russian press. Publicity was given to the event as part of a campaign to encourage native inventors and to promote production of automatic weapons. Figure 2 6. Maxim-Kcleshnikov Machine Gun, 7.62-mm, as used in the Spanish Civil War. the first time during the Spanish Civil War and later in the war between Finland and Russia. In competition with tin* M T was another version of the Maxim. This gun was modified bv Koleshnikov and therefore called the M K (Maxim-Kolcshnikov). It differs outwardly from the M T in the shape of the stock, but otherwise there is little difference. Kolcshnikov was not successful in securing adoption of this weapon, but enough were made for trial to allow its use in the Spanish Civil War. 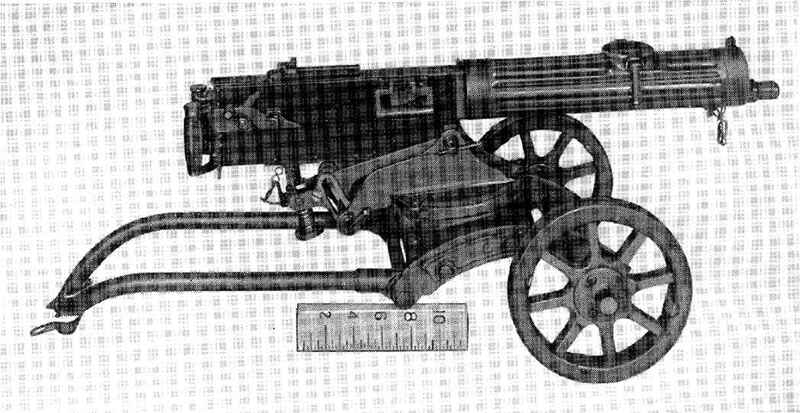 A designer of the same name is credited with the development, some years later of a machine gun mount for a calibcr 12.7-mm gun that was then being issued to the Russian Infantry. There was still another Russian version of the Maxim, inspired by the German T. u. F. of World War I. The Soviets accomplished the design by simply scaling up the rifle-caliber weapon until it handled a 13-mm cartridge. It is sometimes known as the Esiunin machine gun from the name of the engineer who is credited with the design. With Russia s defeat and the Czars overthrow, the Bolsheviks were slow in getting the country's production potentialities under control and almost nothing was done in the development of machine guns, other than trying to modify a number of Maxims left over from imperialist days to use a 13-mm cartridge. This work was first attempted in 1926 at the principal government arms manufacturing arsenal (Tulski Oruzhcnic) at Tula, where K. Esiunin was design engineer. Kigure 2-7. 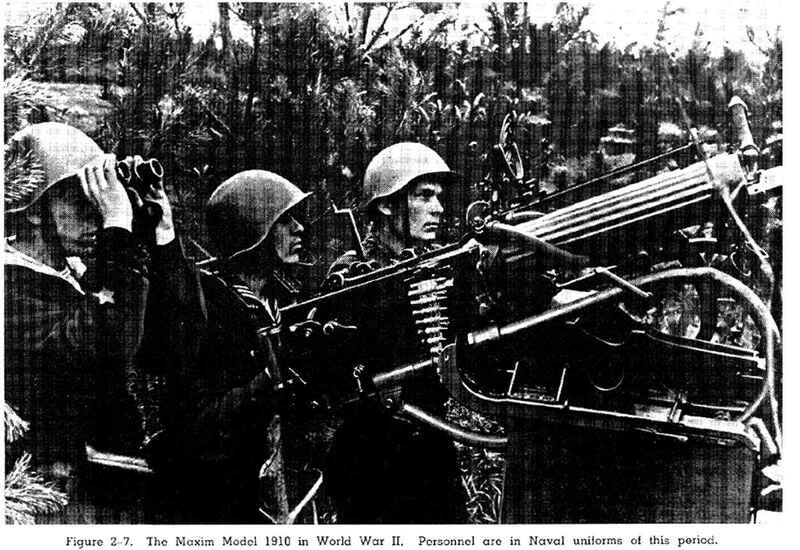 The Maxim Model 1910 in World War II. Personnel arc in Naval uniforms of this period merits. Subsequently, all work stopped on this heavy type Maxim, and production activity centered on the standard rifle caliber weapon. nineteen hundreds, Captain of the Guards Vladimir Grigorevich Federov worked on a design for a fully automatic shoulder rifle. In the course of his work, at the Proving Ground at Orenienbaum, he met a young soldier who had been a machinist at the Tula factory, Vasiliv A. Degtyarcv. The meeting was the beginning of a long association, which lasted until Degtvarev died. In 1908, these two men were working at Sestorets Fire Arms Plant; at the same time, Cossack F. V. Tokarev was working there on another automatic rifle design. Other systems were under development by Roschepci, Schukinn, and Frolov.